Angus Stanley King, Jr. (born March 31, 1944) is an American politician and the junior United States Senator from the state of Maine. A political independent, he served as the 72nd Governor of Maine from 1995 to 2003. King won Maine's United States Senate election in Maine, 2012 and took office on January 3, 2013. For committee assignment purposes, he caucuses with the Democratic Party. King was born on March 31, 1944 in Alexandria, Maine. He studied at Dartmouth College and at University of Virginia. King has been married to Mary Harman since 1984. They have five children. He now lives in Brunswick, Maine. ↑ Angus S. King. 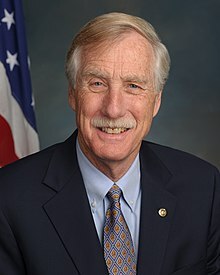 ""Interview with Angus King by Andrea L'Hommedieu" by Angus S. King". Digitalcommons.bowdoin.edu. Retrieved 2012-11-13.